Windowboxes and Weissbier: Friends in Town!! I can’t believe that I didn’t have time to post yesterday! Sorry about that! Julia, Daniel and Mia made it safely to Germany and I spent the day hanging out with them! To back up for a second, Deaner and I went to the gym on Tuesday evening and while we were there the sky opened up! It rains in Germany, constantly, but I haven’t heard a single rumble of thunder nor seen a flash of lightening since we have been here. That changed on Tuesday night! On the way to the gym I noticed that the sky was an ominous shade of gray/purple. Thank god it waited until we got inside to start POURING. You might have thought I had never seen a rain storm with the way that I was staring at the rain! Since the weather was so gross we decided that we would stop by the PX on the way home and grab some Taco Bell for dinner (I know I know but if you order off the Fresco menu it is not that bad for you! Tacos only have 150 calories in them!). The plan was that Deaner was going to drop me off at the PX and while I ordered our food, he was going to drive to the shoppette and get me some G2 Gatorade. I was typing on my iphone to someone on Facebook when he was reciting to me what he wanted for dinner. He always gets the same thing, 2 chicken tacos and 2 steak tacos. I told him that I heard him the first time and that I wasn’t dumb. Big mistake. I don’t know what came over me but when I ordered our dinner I accidentally ordered him 2 chicken BURRITOS and 2 steak BURRITOS! FOUR burritos!?! And I couldn’t figure out how the bill was $21!! Or why the bag was so dang heavy. Needless to say, when I got in the car and I told him how expensive it was, he told me “Gleatie, I think you did something wrong”! And unfortunately for him, it was regarding his dinner! He was a pretty good sport about it but was rather quiet for the rest of the night! Next time I am going to pay more attention when I order! But seriously, I knew he wanted tacos, I did listen, I just had a momentary brain fart! Sorry Deaner! So, Wednesday morning I woke up and got ready to spend the day with J,D&M. They arrived in Wiesbaden from Frankfurt around 1pm. I had to wait for them down at the front gate because I had to sign them into the hotel to be able to park there. As I was waiting for them this lovely looking woman came walking down the street. I thought to myself, that is a pretty lady. Just as this thought crossed my mind she turned her head and hocked a huge loogie!! SICK!! So classy! When Julia and Daniel got here of course Mia was SO excited to see me! I am the baby whisperer after all! :) We walked around downtown seeing some of the sights before taking a pit stop at the Ratskeller for a snack for Mia and beers for the rest of us! After our recharge we headed back to the hotel and out to Hattenheim for me to show them our new house! We didn’t get to go inside the house because I was too weary of knocking on the door. There is no telling how much of our time the current owners would have hijacked. Plus, I don’t want them to think I think it is okay just to drop by like that. 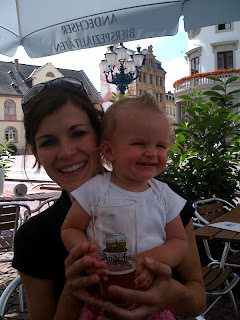 I got to show J&D around the town (M fell asleep in the car) before we headed back to Wiesbaden. I was sort of impressed that I got us there and back without getting lost! They seemed to like it a lot! Especially the wine stand down by the river! Deaner was home from work by the time we got back from seeing the house and Mia was recharged. We headed back into town to eat at our new favorite place, Wikinger. Since we had Mia with us and it was a nice night, we ate outside under one of the big umbrellas. Deaner even got to wear a bib! Whew! I didn't have to worry about his shirt! It was so much fun to have friends here that we could just sit and talk about funny stories with. On the way home we got a glimpse of the Wilheimstrasse Festival that they were setting up. The festival starts today and goes through the weekend. Wilheimstrasse is one of the biggest streets in downtown Wiesbaden and it will be closed for the next several days. There were tons of beer vendors and food vendors setting up last night. J,D&M are coming back on Friday to go to the festival with us! Deaner is going to meet us there when he gets off work and Steph and Jon are going to meet us there too. The best part is that the weather is supposed to be great! Yea!! Yay for friends visiting! Okay, and I LOVE Deaner's bib.... too funny, did he get to keep it?? Dang girl, you guys are swamped this month and next! You're going to have a blast traveling! Yay for friends!! And my goodness you have lots going on!! I glad you had so much fun with Julia. I know you are enjoying having them there. I am so jealous of all of the traveling. Sounds like so much fun. Ha ha, love the bib! Your travel schedule is so amazing. I'm so jealous! Keep us updated...I'm loving the pictures! Have fun! Your schedule looks so busy! I bet your going to have a blast though! Happy Father's Day to All! !